Want to design a kitchen that's eclectic and love-worn, or retro with a dash of playfulness? The term ‘vintage style’ can mean different things to different people; there is no established design formula. There are, however, a few simple guidelines that will help you to evoke the right atmosphere, which we're covering below. And if you want all the practical advice you'll need to get your transformation going, there isn't a question we can't answer over on our ultimate guide to planning and designing a kitchen. 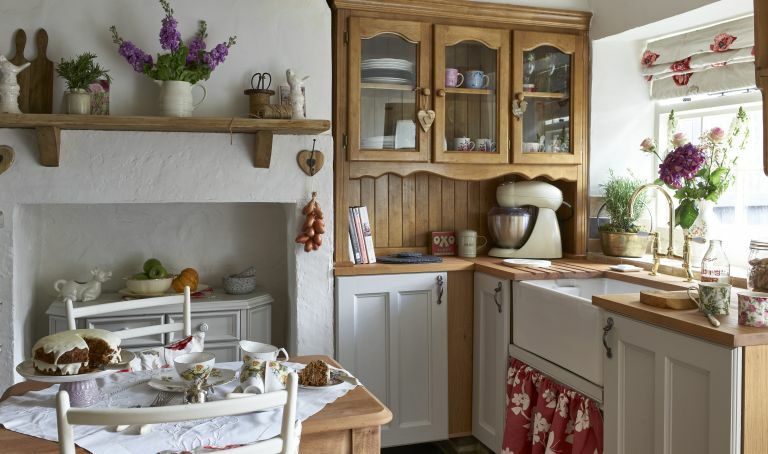 The one thing that unites all kitchens in this style is that they reflect a sense of nostalgia – looking back to simpler, wholesome times and happy childhood memories. This makes mastering the art of display crucial. Quirky, boldly coloured appliances, rustic beaten-up tins, crates and utensils, chintzy mismatched china, copper pots and pans, and other vintage kitchenalia should all be proudly displayed. Place on open shelving, in glass-fronted cabinets – which should not be lined wall to wall – or hanging on hooks. Old crates repurposed as shelves look fantastic. The best vintage kitchens let the accessories do the talking, so ideally keep the units simple, and top them with timber work surfaces. Solid wood cabinets, left bare or painted pastel or muted shades, with rounded timber door knobs, create the right level of laid-back charm. If you want any more kitchen cabinet ideas, we have lots that of ideas would work in a vintage-style kitchen over in our dedicated feature. For a more retro look though, nothing beats original aluminium English Rose units – a classic design produced throughout the 1950s. Made from top-quality materials after World War II, in factories that made parts for Spitfires, they are a perfect example of great British engineering, and reclaimed units are very desirable (try Source Antiques). Love the look of a retro kitchen? Go and have a read of our inspiring gallery. Alternatively, John Lewis of Hungerford produces a spot-on vintage kitchen. One thing a vintage-style kitchen should never be is perfect: a bit of wear and tear only adds to the charm. Do not distress pristine units, but do pick up old worn furniture (check it is structurally sound) from flea markets or antiques fairs – perhaps an old dresser on which to display china, or a farmhouse table and Windsor chairs. Mismatching the chairs creates a sense of evolution; paint chairs in different colours and rub the edges with sandpaper for a pretty, shabby-chic effect. If you need any tips on how to paint furniture, we have a handy step-by-step guide to help you out. Appliances in most vintage-style kitchens tend to be very Fifties inspired, in bold or pastel colours with soft, curvy edges. Modern appliances, such as those from Smeg are perfect for a vintage kitchen. Original vintage fridges can be refurbished, making them fit for the 21st century (try The Vintage Fridge Company). Fabrics are key to adding warmth and texture to the look. Opt for blinds, curtains (and, as an aside, shutters work, too), tablecloths and tea towels in brightly coloured floral prints; classic combinations include bright reds, pinks and aqua or you could opt for more Fifties-style pastels, such as yellow, blue or green. Finish the look with a retro oilcloth and mismatched chair cushions. Wallpaper is also a great way to add interest to a vintage-style kitchen. Choose a print that's subtle (floral always works) and matches your over all colour scheme. We recommend choosing something in a neutral tone, just so it doesn't get too busy with out the other vintagey finds you'll have going on in your kitchen. But that needn't mean plain – an intricate pattern will work too. We love this botanical inspired wallpaper from The Little Greene Paint Company is muted colours don't create too much distraction but the traditional small print definitely has a country cottage appeal. For more lovely kitchen wallpaper ideas go and have a look through our gallery.